Posted 5/30/2014 8:16am by Cheryl Ferguson. We finally got the tomatoes planted -- over 1/4 acre of future deliciousness! There are 33 varieties of fruits, slicers and paste tomatoes. The good news is that everything is all set with irrigation and is trellised! And the field looks really good! Volunteers still needed! Thanks to several of you for volunteering to help with the upcoming Triad Farm Tour sponsored by the Carolina Farm Stewardship Association (June 7 & 8). We still need a few more folks to help. If you are available to volunteer here at the farm on either Saturday or Sunday (2-6), we would be most appreciative! Please send us an email if you would like to help! It's going to be lots of fun! Market Update: What will you find on our tables this week? We'll have lots of Certified Organic garlic scapes (and lots of recipes), sugar snap peas (best ever! 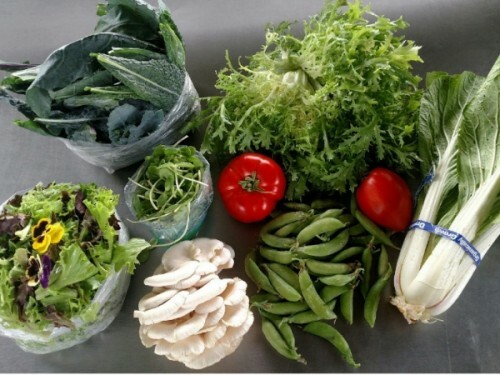 ), baby kale, baby swiss chard, salad mix (new lower price), baby beets (few), pea shoots, bunching onions (purple and white), broccoli raab, blackberry & black raspberry plants, transplants (tomatoes, tomatillos, basil and other herbs, peppers and eggplant), garlic powder and MORE! We are happy to save an item for you in advance if you'd like. Just shoot us an email before the market. Savor the last days of May -- go outside and see the lightning bugs! I've been seeing them now for about 3 weeks! Talk to you next week. Posted 5/23/2014 7:28am by Cheryl Ferguson. The word of the week? GARLIC! Around here there's a project that we fondly call Garlic-palooza. This event is when we harvest, clean and bundle a huge amount of garlic for The Produce Box. This is our 4th year of this adventure and our biggest production to date. A total of 3,865 bunches of garlic have/will be delivered to Raleigh for delivery to some of The Produce Box's members. The Produce Box is what is known as a food hub. They purchase produce from NC farmers (over 40), package it into one of a variety of box options, and then deliver it to the member's home. It's a great service that operates in the Triangle, Triad and Wilmington areas of the state. In case you are wondering how much garlic that is, there are about 6 pieces of garlic per bunch on average, so multiply that by 3,865 and it equals 23,190!! Yowza! Please send us an email if you would like to help! If you have a particular interest, we can try to match you with it -- we want to find a task that works for you! Plus we'll make sure you have lots of fun! Market Update: This weekend at Old Salem there will be the The Vintage, the annual classic BMW Show. Main street will be blocked between Academy & West Streets but there should be no parking challenges. Last week our tent was visited by P. Allen Smith - he even tried our Raspberry-Baby Ginger Jam! We'll be back at the King Farmers Market on Wednesday. What will you find on our tables this week? We'll have lots of Certified Organic Spring Garlic (LAST week), garlic scapes, sugar snap peas, baby kale, baby swiss chard, salad mix, baby beets (few), pea shoots, bunching onions (purple and white), broccoli raab, blackberry & black raspberry plants, transplants (tomatoes, tomatillos, basil and other herbs, peppers and eggplant), garlic powder and MORE! And for your Memorial Day weekend grilling, our Raspberry-Chipotle Molé Sauce is a real crowd pleaser! Enjoy the Memorial Day weekend and say a word of thanks to those that have served. And take a few minutes to stop, relax and enjoy the sunset. Talk to you next week. Plum Granny Farm Weekly Update - Farm Tour Volunteers Needed!! Posted 5/16/2014 10:09am by Cheryl Ferguson. Things are starting to shape up in the fields -- although we still have lots more planting to do. The potatoes are emerging nicely and have already been cultivated and hilled once. New crops are starting to replace older ones -- we are replanting some of the overwintered kale and the asparagus is at its last harvest. Meanwhile the sugar snap peas are blooming (may have some for market!) and the bunching onions are ready to go. The garlic is sizing up nicely and the scapes are just beginning to form on the hardnecks. Our bees have been very active this year. The Well-Bees hive has thrown off a 2nd swarm. We managed to catch it at the same place we caught the first one - at the house in front of Daddy's Cub tractor. Here's a picture of them right after they left the hive and were hanging out in the tree. Amazing, isn't it? Calendar alert! We are excited to be included in the upcoming Triad Farm Tour sponsored by the Carolina Farm Stewardship Association June 7-8 . This is its first year and there are 17 farms on the tour. If you are available to volunteer here at the farm on either Saturday or Sunday, we could use some help! We need about 5 volunteers each day. Please send us an email if you are interested! We'll make sure you have lots of fun! Market Update: It will be a very busy weekend at Old Salem tomorrow. They are hosting the Pottery Fair on the Square and P. Allen Smith is in the village filming - rumor has it that he may be making a stop by market tomorrow! At the Wednesday King Farmers Market, we have started a new garden & cookbook lending library! What will you find on our tables this week? We'll have lots of Certified Organic Spring Garlic, asparagus (LAST week), baby kale, baby swiss chard, salad mix, baby beets (few), pea shoots, bunching onions, broccoli raab, radishes, blackberry & black raspberry plants, transplants (tomatoes, tomatillos, basil and other herbs, peppers and eggplant), garlic powder and MORE! Talk to you next week. Enjoy the cooler temps this weekend -- even the bees thought it was mighty hot earlier this week! They were hanging out on the porch waiting for someone to turn on the AC! Posted 5/8/2014 4:57pm by Cheryl Ferguson. Happy Thursday, Farm Friends! It's the 69th anniversary of V-E Day! If you've spent more than 12 seconds with a farmer, you'll figure out that the most important topic on his or her mind is the weather. Yes, it's true -- that's just about all we talk about! These days we are talking about how it has gotten so dry. It seems that we went from deluge to drought. Our irrigation system has been getting a workout -- something we would have not imagined a month ago. But that's okay - we are thankful that we are having some nice sunny days! With the warmer weather the brambles are starting to get bushier and we are seeing some flower buds! And the Ouachita blackberries are in full bloom! We're not sure if there is enough foliage to support all of this fruit -- definitely some research is needed! We had a wonderful time reconnecting with so many of you at the grand openings of the markets. Cobblestone Farmers Market at Old Salem was amazingly beautiful last week. At the King Farmers Market at the Stokes Family YMCA we had a terrific turnout as well! What will you find on our tables this week? We'll have lots of Certified Organic Spring Garlic, asparagus (purple & green), baby kale, baby swiss chard, salad mix, mesclun mix, frisse, baby beets (few), pea shoots, baby bok choy, blackberry & black raspberry plants, transplants (tomatoes, tomatillos, basil and other herbs, peppers and eggplant), garlic powder and MORE! We are extra excited about markets this week because our Allium Adventure Club members will be getting their first boxes! If you are one of those people who like to wait to the very last second, the time is NOW if you want to join the Club! Check out the website to download a form and email it back right away! Don't forget that Mother's Day is Sunday and I'll bet your mom would love a jar of jam or a beautiful blackberry plant - don't you think? We are happy to save an item for you in advance if you'd like. Just shoot us an email the evening before the market. Plum Granny Farm Weekly Update - Let the Markets Begin! Posted 5/1/2014 11:24am by Cheryl Ferguson. Happy Thursday, Farm Friends! Happy May Day!! We are feeling thankful that we didn't get hit by any severe storms over the past couple of days. Sky-watching and weather.com-checking were constant activities. Our hearts go out to all of those who were not as fortunate as we were. To get a jump on the predicted rain, we finished up the rest of the fingerling potatoes on Monday. As an homage to the Kentucky Derby, we popped out of the starting gates like prize Thoroughbreds and got the last 3 rows (300'+ each) planted, covered and marked in less than 2 hours! All 542 pounds are now nicely tucked in! Keep your fingers crossed because we want to share these goodies with you! Other planting is underway as well. Artichokes are going in the field along Flat Shoals Road and will hopefully produce 2 crops -- this fall and next spring. 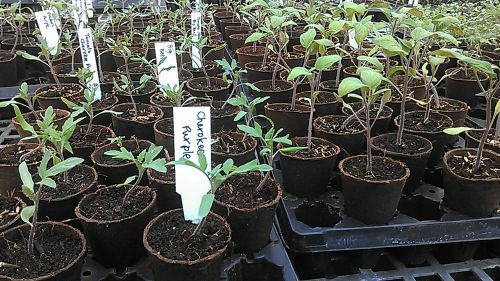 Tomatoes, tomatillos, peppers, okra and eggplant are also slated to be planted very soon! The transplants are getting so big -- you can almost hear them say, "Plant Me NOW" every time you go into the greenhouse! Speaking of greenhouse, thanks so much to all of you for coming out to our first Open (Green)House event last weekend! The weather was perfect and the visitors couldn't be beat! Thanks for sharing some of your weekend with us! Congrats to the winners of the door prizes: Tilda Vernon (Allium Adventure Club Weekend Explorer Membership); Brian Hart (Worm Composting system); Carol Wood (1 lb. raspberries); Laurel Ineman (1 lb. blackberries) and Philip Hatton (jar of Raspberry-Cranberry Jam). This weekend will be the opening of the Cobblestone Farmers Market at Old Salem! Market begins at 9 and runs until noon. There may be a bit of congestion at the beginning of market due to the colon cancer awareness run (the UNDY 500!) but all parties are apprised of our market and have promised to keep traffic flowing. Whoo-hoo! Saturday will be the first offering of our Spring Garlic! We'll also have lots of Certified Organic asparagus (purple & green), baby kale, baby swiss chard, salad mix, frisse, baby beets (few), blackberry & black raspberry plants, transplants (tomatoes, tomatillos, basil and other herbs, peppers and eggplant), garlic powder, jam and MORE! On Wednesday, May 7, the King Farmers Market at the Stokes Family YMCA will have its opening day! Market hours are 11-1 and is located in the parking lot at the Y. We'll have most of the same products available on Wednesday. It's always so exciting when our farmers markets open for the season! We really enjoy seeing our great customers and getting a chance to catch up on your lives. And we are truly honored to be given the opportunity to provide food for your families. Plum Granny Farm Weekly Update - Open Greenhouse & Pop Up Market Tomorrow! Posted 4/25/2014 9:03am by Cheryl Ferguson. Gave you a break last week from our meandering thoughts -- but this week, we're back at it! Springtime on a farm is a very manic time -- although the days are getting longer, so is the to-do list. Things to plant! Fields to prepare! Ginger to tend! Grass to mow! It takes lots of planning and concentration to try to stay on task -- but it is a reality that by 10 a.m., you are already on Plan G (the 1st 6 plans have already vaporized!). Sigh... But the good news is that we actually are ahead on some of our spring tasks -- and that feels VERY good! The fill-in raspberries were planted last week -- and even got weeded by our weeding demon, Emma! Here she is showing her skill at the task. Most of the potatoes were planted yesterday. The soil conditions and seed potatoes looked great so we are very hopeful for getting a nice harvest. The standard potatoes and half of the fingerlings are now tucked in the ground. Next week the eggplant trap crop will be going in to surround the field. We read about using eggplant as a trap for the potato's archenemy, the Colorado Potato Beetle. Apparently the beetles like eggplant even more than potatoes so they will get to snack on the eggplant and will leave the potatoes alone -- at least that is the plan. This will be a VERY busy weekend! Our First Annual Spring Open (Green)House event will be on Saturday (9-3) and Sunday (1-4). We'll have LOTS of certified organic transplants (heirloom tomatoes, tomatillos, herbs, eggplant, pepper) as well as berry plants (raspberry, blackberry and black raspberry). You can even get soil amendments, produce, and jams. Our friends from Be Nutty Bakes and Butters will have baked goods featuring farm products and along with their yummy peanut butters! There will be farm tours and a drawing for a worm composting bin and a mini-membership to the Allium Adventure Club! It is supposed to be a GORGEOUS weekend so head on out to Stokes County for some fun! In addition to the Open (Green)House event, we will also be at the Cobblestone Pop Up TOMORROW (Saturday, April 26) from 9 to noon. The market will be held at the parking lot behind Mary's Gourmet Diner (7th and Trade) in Downtown. We'll have lots of Certified Organic baby kale, swiss chard, salad mix, frisse, sugarloaf radicchio, salad turnips, pea shoots, blackberry & black raspberry plants, transplants (tomatoes, tomatillos, basil and other herbs, and eggplant), garlic powder, jam and MORE! Whew! A busy weekend for everyone! We hope to see you at one place or the other (or both!) -- celebrate the last weekend in April with a belated party for the planet (PEA's Earth Day Fair is also this weekend) by heading out and supporting small, Organic farms! 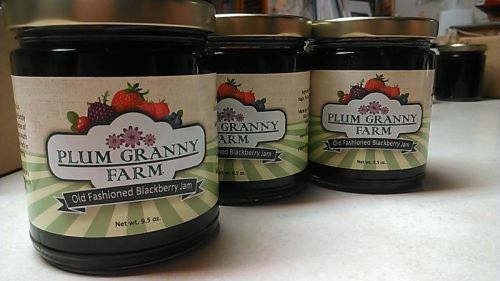 Plum Granny Farm Weekly Update - Pop Up Market Tomorrow! Posted 4/11/2014 2:56pm by Cheryl Ferguson. What a beautiful week to get things done around the farm! Spring is really putting on its beautiful colors. The yellows of the daffodils are being replaced by the brilliant yellows of the gold finches at the bird feeder. The haze of white at the dogwoods are now turning into flowers. Lots more onions in the ground (a big thanks goes to Bill Talich letting us know about the great song, "I Love Onions", it entertains us while we plant). Here are Emma & Elliot proclaiming victory over unplanted onion transplants! And don't forget, we are still accepting memberships for the Allium Adventure Club. But better hurry-- the tour begins on May 3rd! A great thing about being is small farm is how farmers help each other. Today we loaded up 5 other farmers with a shared load of soil amendments. Bill Smith of Old Town Farm in Walnut Cove worked with us to coordinate a 5 pallet tractor trailer load from Seven Springs. It was a win-win for all of us -- we shared the shipping cost and were able to get a much better price than we would if we had ordered individually. That's one of the many beautiful things about the farming community. It's hard to believe but after 4 months, we are back at market! We will have our first Cobblestone Pop Up TOMORROW (Saturday, April 12) from 9 to noon. The market will be held at the parking lot behind Mary's Gourmet Diner (7th and Trade) in Downtown. We'll have lots of Certified Organic baby kale, swiss chard, salad mix, sugarloaf radicchio, salad turnips, pea shoots, blackberry & black raspberry plants, transplants (tomatoes, tomatillos, basil and other herbs, and eggplant), garlic powder, jam and MORE! Talk to you next week. Enjoy the Full Pink Moon and Blood Moon Eclipse on Tuesday! Plum Granny Farm Weekly Update - Pop Up Market on Monday! Posted 4/4/2014 4:22pm by Cheryl Ferguson. With the rain pouring down, the organizers of the Mini Cobblestone Farmers Market Pop Up at Wake Forest University scheduled for today have moved that event to Tuesday, April 22 from 5:30-8 p.m. Just wanted to let you know in case you planned on heading out in your galoshes! Don't despair because we'll still be at the Cobblestone Pop Up this Saturday, April 12 from 9-noon. We'll send out details of what will be on our table later this week. Stay dry! Welcome to April -- not necessarily the cruelest month (so far at least!) but definitely most frantic!! As we say around here in Stokes County, "we are wide open!" Planting, preparing beds, doing soil tests, seeding, trellising the brambles, mowing, and MORE have all been on this week's schedule! Elliot with the 17 boxes of soil samples to be shipped to Raleigh for testing. Picking up the cocoapeat coir for ginger from our friends Susan and Howard from East Branch Ginger and Aerocoir. A budding Triple Crown Blackberry plant! Here's some exciting news about upcoming markets! We will be part of a Mini Cobblestone Farmers Market Pop Up at Wake Forest University on Monday, April 7 from 3:30 -- 6 p.m. The market will be on Davis Field on the WFU campus. Parking will be available along the road. We'll have kale, salad mix, sugarloaf radicchio, Kids Garden Kits, blackberry & raspberry plants, garlic powder, jam and MORE! We will also be part of the Cobblestone Pop Ups on April 12 and 26 -- more on that later. And while you have your calendar out, make sure you have April 26-27 marked for our first ever Open Greenhouse Days! Whew! Just have to leave you with one more photo -- here's Wally playing the role of an overbearing supervisor when Ray was planting onions last week. I posted this on Facebook and it got the most "Likes" of any we have posted! Gotta love our crazy cats! And speaking of Facebook, don't forget to "Like" us there too! Talk to you next week. Go find as many blooming things as you can! But don't plant tomatoes!!! Posted 3/28/2014 6:55pm by Cheryl Ferguson. Despite having a short week due to weather, travel and a workshop, we've been getting lots of things done. The paths for the Demo Garden beds have been mulched and are just waiting for us to fill them with soil and plants! We didn't think that we would get to see this so soon, but we found out that the new beds look nice in snow! We've also been doing one of our favorite tasks -- PLANTING! Got in a lot of onions as well as bok choy, broccoli raab, and swiss chard. More pepper seeds have gone into trays (LOTS of shishitos and aji dulce). We finally got the heat mats working correctly so the peppers and tomatoes are nice and toasty and will sprout sooner. With the warmer weather (temps are actually not supposed to dip below 40 this coming week! ), we decided to take down the walls of the greenhouse "Germination Room." You may recall that we erected a little plastic and rowcover room in the greenhouse to reduce our propane use and costs. Interestingly almost as soon as the second sidewall dropped, the heater turned on! It was definitely doing its job keeping a smaller space cozy. Enjoy the last few days of March (going out like a lamb, I wonder?)! Posted 3/21/2014 2:18pm by Cheryl Ferguson. Happy Friday, Farm Friends! It's Spring! The arrival of this important date has probably never been more anticipated than it was this year. Gloomy wet and cold days seemed to be the unending norm, and as a farmer they required much patience....something that we need to learn from our dog Gesti (here at the window with her beloved blue stick waiting for us to come in and play)! Thank goodness the arrival of Spring has been more than just the turning of the calendar -- the past couple of days have been gorgeous! Even our tiny little peach tree shares our enthusiasm over the sunshine and warmer temps! Later this afternoon we will be planting the first of our onions (they didn't arrive last week)! Alisa Craig, Walla Walla, Pumba and Desert Sunrise will be the first varieties (all large sweet onions) and we'll be following them up with the first of the bunching onions. And just a pitch for the Allium Adventure Club -- we still have spaces for the journey and you'll be the first to get goodies in May! Don't forget to check out the website for more information (http://www.plumgrannyfarm.com/allium-adventure-club) and sign up TODAY! We are sure that you won't want to miss this grand adventure! Memberships are available for both 15 and 30 weeks. The good news is that Ray visited the hive this morning to see how it was doing and if he could find the queen. The hive was doing great! At least 10,000 bees and a very healthy queen! Here's a picture -- can you see the queen? She's in the lower left corner of the photo -- getting ready to lay an egg! Needless to say we were very happy! Get out there and be (bee?) happy too! Revel in the sunshine, gather daffodils and rejoice in the beauty of Spring!